“Banzai for our Army & Navy! N.Y.Y. 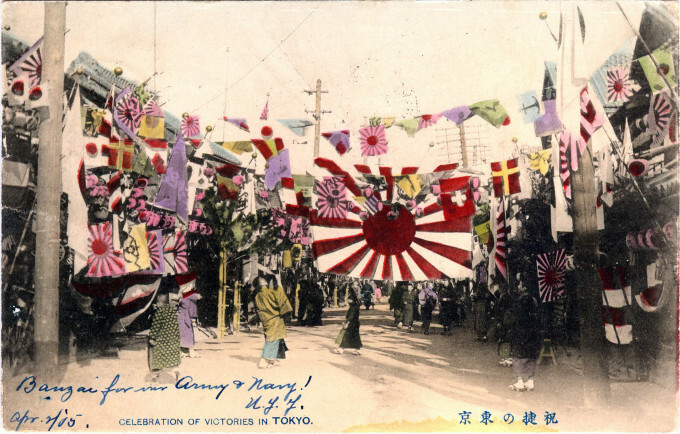 Apr 2, ’05.” Celebration of Victories in Tokyo, 1905. From the wiki: “The Russo-Japanese War (8 February 1904–5 September 1905) was ‘the first great war of the 20th century.’ It grew out of rival imperial ambitions of the Russian Empire and the Empire of Japan over Manchuria and Korea. “Russia had demonstrated an expansionist policy in Manchuria dating back to the reign of Ivan the Terrible in the 16th century. Japan offered to recognize Russian dominance in Manchuria in exchange for recognition of Korea as a Japanese sphere of influence. Russia refused this, and demanded that Korea north of the 39th parallel be a neutral buffer zone between Russia and Japan. The Japanese government perceived a Russian threat to its strategic interests and chose to go to war by attacking the Russian eastern fleet at Port Arthur, a naval base in the Liaotung province leased to Russia by China. 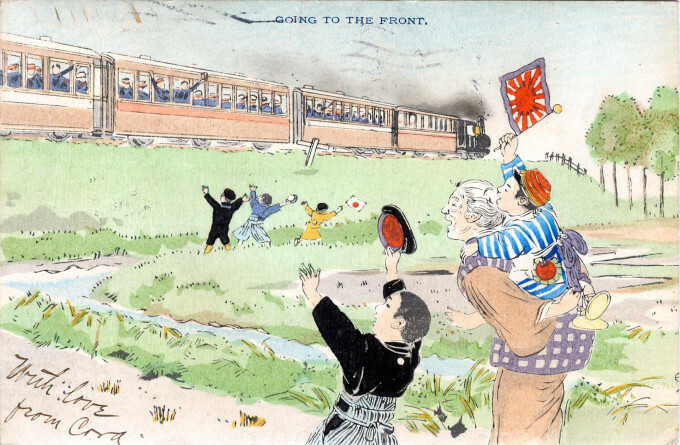 “Going to the front,” 1904. 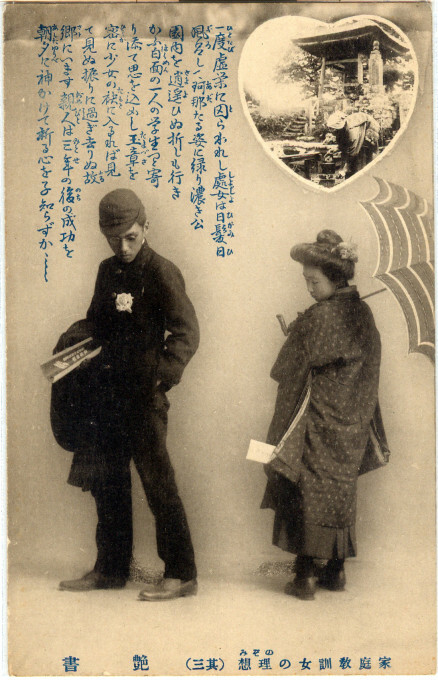 “The patriotism of the Japanese people strikes even an American as something extraordinary and phenomenal. I have seen women stick little cotton flags in the fists of the babies on their backs, and stand for hours beside a railroad track, waiting for a train-load of troops, satisfied if they could only throw a pack age of cheap cotton towels into an open window, or even wave their handkerchiefs once to the men who were going to the front. 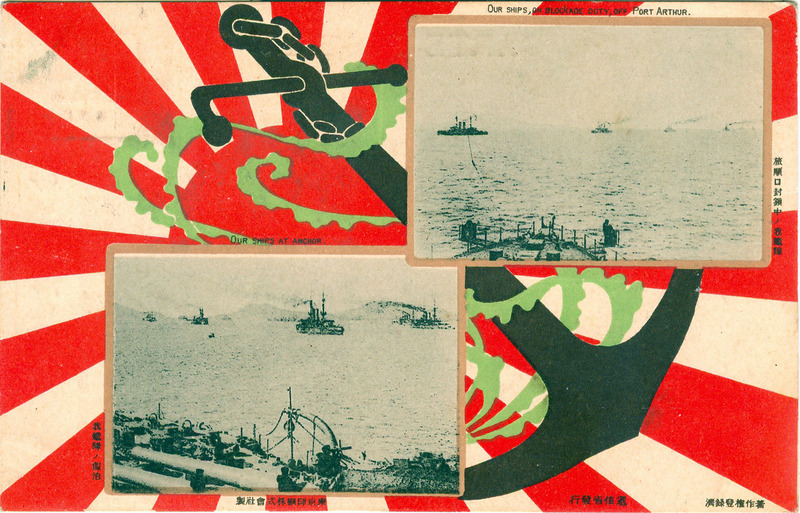 ‘Please remember, that though I will die, Nippon Teikoku [Great Japan] should have victory and honor. “Our ships, on blockade duty, off Port Arthur”, c. 1905. “At dead of night Japanese destroyers found the Russian Pacific Fleet at anchor in the outer harbour, peacefully asleep with its lights on. They fired their torpedoes and hit two Russian battleships, the Tsarevich and the Retvizan, and the cruiser Pallada. When day came, Japanese battleships shelled the Russian warships, which had retreated into the protection of their shore batteries. On the same day a Japanese army took control of Seoul, the capital of Korea, and on the 10th, Japan declared war.